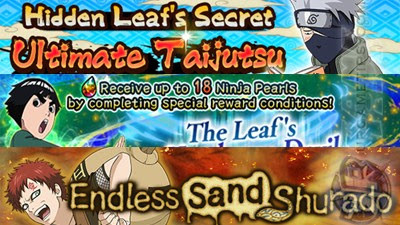 Here's a list of farmable ninjas that can be found from the Emergency Mission stages, in the Android and iOS mobile game: NARUTO SHIPPUDEN: Ultimate Ninja Blazing. - These ninjas can only be farmed from limited time Emergency Missions. Available ninja/s depends on the featured event/s, but don't worry, previous events will eventually rotate and comeback. *The above ninjas can only be upgraded up to 5*. Zabuza Momochi - The Measure of the Demon NEW! Rasa - Family Values NEW! - These ninjas can't be awakened to 6*, unless stated otherwise. - Check event notifications in-game for more info on the current or upcoming event. - You can max out their passive abilities by fusing in more dupes. - You can increase their Luck stat to up to 80 or 99, giving your team higher drop rates during battle (when used as Captain). - Optional: For Raid characters that you like, you may also keep and upgrade 2 copies for your mono-element teams. - Try to complete higher ranked missions if you can, to increase drop rates. The drop rate is constant per mission in this event (drop rate is dependent on the difficulty). - Join multiplayer mode as a Host to increase your team's Total Luck, for a higher chance to get "Lucky Drops" (also contains dupes). Field Skill Boosts critical rate by 1.3-1.8x. HP STR Buddy Skill Reduces the chance of receiving immobilization by 20% (Not Field Skills). Field Skill Boosts critical rate by 1.4-.1.9x. Field Skill Reduces the chance of receiving jutsu sealing by 15%-20% (Not Field Skills). HP STR Buddy Skill Reduces the chance of receiving slip damage by 30% (Not Field Skills). - Impact Raids are similar to Emergency Missions, but it is time based. Raids can only be done at certain periods (usually every 2 to 3 hours) of the day. Check event notifications in-game for more info on the current or upcoming event. - These extreme event and ninjas are similar to a regular Emergency Mission raids, but the catch is, you can only raid and farm them within 1 day! - These ninjas can be awakened to 6* Stars! - Some blitz raid characters will only drop from certain Mission Ranks, so refer to the event notifications in-game for more info on the current or upcoming event. - Example: Hashirama Senju - Father of Leaf Village will only drop from Ranks [S] and [A] missions. - Same as above, but these ninjas can reach up to 99 Luck stat.